With beautiful, durable sunroom and patio enclosures from ABC Seamless, you can transform your patio, porch, or deck into a beautiful outdoor living space that can be enjoyed rain or shine. When our highly experienced technicians install a patio covering or TEMO sunroom on your home, you will have the perfect spot for entertaining friends, gathering with family, or simply relaxing on your own – the possibilities are endless. No matter how you decide to enjoy your sunroom, you’ll never need to worry about freezing winter winds, sizzling summer heat, or irritating insects when you’re inside one of our patio enclosures. Additionally, our TEMO sunroom patio enclosures are backed with a transferable lifetime warranty that covers the roof, window hardware, weather stripping, aluminum frames, and many other components. 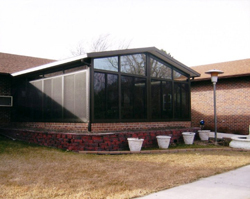 To learn more about our TEMO sunroom patio enclosures and for a free consultation, contact us today. We’re proud to serve homeowners in Council Bluffs, Bellevue, Grand Island, Holdredge and in surrounding Nebraska and Southwest Iowa communities. We are also a siding contractor that installs not just seamless residential siding, but also many other products, including steel roofing, energy-efficient windows, porch enclosure systems, and much more.